The blood-brain barrier (BBB) is a cellular and metabolic barrier located at the capillaries in the brain that alters permeability, restricting the passage of some chemical substances and microscopic objects from the bloodstream into the neural tissue, while allowing other substances to pass into the brain. For example, the blood-brain barrier restricts the passage of bacteria, red-blood cells, and certain toxins and water-soluble molecules into the brain while allowing the passage of oxygen, glucose, amino acids, white-blood cells, anesthetics, and alcohol. Found in all vertebrates, as well as in certain invertebrates (such as the squid and octopus), the blood-brain barrier functions to protect neural tissue from harmful chemicals and bacterial infections. It also works to control volume in the vertebrate brain, with its hard brain case, by maintaining constant levels of ions and peptides and limiting the movement of water and salts. There are several components of the blood-brain barrier in vertebrates. On the main features is the tight junctions involving cells in the brain blood capillaries that are tightly sealed together. There also is lipid/protein bilayer that protects against water-soluble substances, an enzymatic barrier that removes unwanted peptides and other small molecules, and efflux pumps that transport certain molecules back into the blood that have passed into the brain. The mechanism also includes carriers that transport necessary substances from the blood to the brain and removes waste products. The blood-brain barrier is an intricately coordinated mechanism for protecting the brain. It is essential for the functioning of the complex brain of vertebrates. The breakdown of the blood-brain barrier is implicated in several diseases, including meningitis, epilepsy, and multiple sclerosis. However, even when functioning properly, the blood-brain barrier cannot protect against the entry of some harmful substances, such as viruses, which have developed mechanisms to bypass the barrier. The blood-brain barrier also restricts the entry of antibodies that help to fight bacterial infections that do occur and makes it difficult for the delivery of water-soluble drugs that have been developed to treat diverse conditions. However, an understanding of the mechanism of the blood-brain barrier has allowed researchers to develop means to deliver such drugs. The blood-brain barrier helps to separate the brain from the bloodstream, allowing the select filtering of molecules and objects that are allowed to enter the brain. Certain substances that are harmful are prevented from entering the brain from the bloodstream, such as toxins and bacteria. Other substances that are necessary for the metabolic activities of the brain, such as glucose for energy, oxygen for respiration, and amino acids for building proteins, are allowed to pass through this barrier. In addition, the barrier helps to maintain the volume of the brain fluid, since the brain is located in a rigid skull. This it does by limiting the movement of salts and water from the blood into the extracellular fluid and the BBB secretes brain extracellular fluid at a controlled rate to help maintain brain volume (Segal 2001). The blood-brain barrier acts very effectively to protect the brain from many common bacterial infections. Thus, infections of the brain are very rare. However, since antibodies are too large to cross the blood-brain barrier, infections of the brain that do occur are often very serious and difficult to treat. Viruses easily bypass the blood-brain barrier, however, attaching themselves to circulating immune cells. The HIV virus uses the brain as a sanctuary, hiding behind the blood-brain barrier from the defense mechanisms of the body (Segal 2001). Several areas of the brain are not "behind" the BBB. One example is the pineal gland, which secretes the hormone melatonin "directly into the systemic circulation" (Pritchard and Alloway 1999). Segal (2001) notes that the blood-brain barrier is found in all vertebrates, as well as in squids and octopuses, with an analogous structure in insects. In humans, it is formed by the third month of gestation. The blood-brain barrier is located at the level of the brain blood capillaries. There are several components of the barrier. Tight junctions. A key component of the blood-brain barrier is the tight junctions between endothelial cells in central nervous system capillary vessels that restricts the passage of solutes. At the interface between blood and brain, endothelial cells and associated astrocytes (type of glia) are stitched together by structures called "tight junctions." The tight junction is composed of smaller subunits, frequently dimers, that are transmembrane proteins such as occludin, claudins, junctional adhesion molecule (JAM), ESAM, and others. Each of these transmembrane proteins is anchored into the endothelial cells by another protein complex that includes zo-1 and associated proteins. The sealing together by tight junctions of the cells making up the walls of the vessels prevents water-soluble substances from freely passing between the cells and entering the fluid environment of the brain cells (Segal 2001). The blood-brain barrier restricts passage of substances from the bloodstream by high density cells much more than endothelial cells in capillaries elsewhere in the body. Astrocyte cell projections called astrocytic feet (also known as "glia limitans") surround the endothelial cells of the BBB, providing biochemical support to those cells. The BBB is distinct from the similar blood-cerebrospinal fluid barrier, a function of the choroidal cells of the choroid plexus, and from the Blood-retinal barrier, which can be considered a part of the whole (Hamilton et al. 2007). Lipid barrier. The tight junctions of the cells making up the capillary walls and the densely packed astrocyte foot processes that surround the endothelial cells of the tight junctions act as a partial, active, barrier. Water-soluble substances can only cross through the BBB by passing directly through the walls of the brain capillaries. But the cell membranes they have to pass through are made up of a lipid/protein bilayer that acts as a barrier against water-soluble molecules and serves as a major component of the BBB. However, fat-soluble molecules, such as anesthetics and alcohol, as well as oxygen and carbon dioxide, can pass straight through the lipids in the capillary walls and enter the brain area (Segal 2001). Enzymatic barrier. In addition to the above-mentioned passive components of the blood-brain barrier, there also are enzymes on the lining of the capillaries that actively destroy undesirable peptides and other small molecules in the blood that is flowing through the brain, thus removing them from the blood (Segal 2001). Efflux pumps. There are three classes of "efflux pumps" in the capillary wall that bind to three classes of fat-soluble molecules that could be toxic and that have diffused through the capillary walls into the brain. These efflux pumps then transport these molecules back into the blood (Segal 2001). These are components of the barrier between the blood and the brain. However, there also are means for water-soluble compounds to cross the blood-brain barrier, such as glucose and amino acids. These are transported into the brain by special carriers on both sides of the cells forming the capillary walls. These also act to move waste products and other undesirable molecules from the brain to the blood (Segal 2001). Paul Ehrlich was a bacteriologist studying staining, used for many studies to make fine structures visible. When he interjected some of these dyes (notably the aniline dyes that were then popular), the dye would stain all of the organs of an animal except the brain. At the time, Ehrlich attributed this to the brain simply not picking up as much of the dye. However, in a later experiment in 1913, Edwin Goldmann (one of Ehrlich's students) injected the dye into the spinal fluid of the brain directly. He found that in this case the brain would become dyed, but the rest of the body would not. This clearly demonstrated the existence of some sort of compartmentalization between the two. At the time, it was thought that the blood vessels themselves were responsible for the barrier, as no obvious membrane could be found. 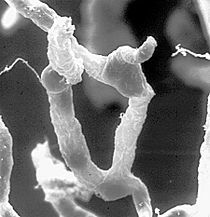 The concept of the blood-brain barrier (then termed hematoencephalic barrier) was proposed by Lina Stern in 1921 (Vein 2006). It was not until the introduction of the scanning electron microscope to the medical research fields in the 1960s that the actual membrane could be demonstrated. It was once believed that astrocytes rather than endothelial cells were the primary physical component of the blood-brain barrier because of the densely packed astrocyte foot processes that surround the endothelial cells of the BBB. Overcoming the difficulty of delivering therapeutic agents to specific regions of the brain presents a major challenge to treatment of most brain disorders. In its neuroprotective role, the blood-brain barrier functions to hinder the delivery of many potentially important diagnostic and therapeutic agents to the brain. Therapeutic molecules and genes that might otherwise be effective in diagnosis and therapy do not cross the BBB in adequate amounts. Mechanisms for drug targeting in the brain involve going either "through" or "behind" the BBB. Modalities for drug delivery through the BBB entail its disruption by osmotic means, biochemically by the use of vasoactive substances such as bradykinin, or even by localized exposure to high intensity focused ultrasound (HIFU). Other strategies to go through the BBB may entail the use of endogenous transport systems, including carrier-mediated transporters such as glucose and amino acid carriers; receptor-mediated transcytosis for insulin or transferrin; and blocking of active efflux transporters such as p-glycoprotein. Strategies for drug delivery behind the BBB include intracerebral implantation and convection-enhanced distribution. Nanotechnology may also help in the transfer of drugs across the BBB (Silva 2008). Recently, researchers have been trying to build liposomes loaded with nanoparticles to gain access through the BBB. More research is needed to determine which strategies will be most effective and how they can be improved for patients with brain tumors. The potential for using BBB opening to target specific agents to brain tumors has just begun to be explored. Delivering drugs across the blood brain barrier is one of the most promising applications of nanotechnology in clinical neuroscience. Nanoparticles could potentially carry out multiple tasks in a predefined sequence, which is very important in the delivery of drugs across the blood brain barrier. A significant amount of research in this area has been spent exploring methods of nanoparticle mediated delivery of antineoplastic drugs to tumors in the central nervous system. For example, radiolabeled polyethylene glycol coated hexadecylcyanoacrylate nanospheres targeted and accumulated in a rat gliosarcoma (Brigger et al. 2002). However, this method is not yet ready for clinical trials due to the accumulation of the nanospheres in surrounding healthy tissue. It should be noted that vascular endothelial cells and associated pericytes are often abnormal in tumors and that the blood-brain barrier may not always be intact in brain tumors. Also, the basement membrane is sometimes incomplete. Other factors, such as astrocytes, may contribute to the resistance of brain tumors to therapy (Hashizume et al. 2000; Schenider et al. 2004). Errors in the development of the BBB in humans can lead to such defects as spina bifida. When trauma or infection makes the barrier leaky, water and salts crossing the barrier can result in swelling of the brain (cerebral oedema), leading to raised intercranial pressure, which can become fatal (Segal 2001). There are currently active investigations into treatments for a compromised blood-brain barrier. It is believed that oxidative stress plays an important role into the breakdown of the barrier; anti-oxidants such as lipoic acid may be able to stabilize a weakening blood-brain barrier (Schreibelt et al. 2006). Several other major conditions tied to a breakdown in the BBB are detailed below. Meningitis is inflammation of the membranes that surround the brain and spinal cord. (These membranes are also known as meninges.) Meningitis is most commonly caused by infections with various pathogens, examples of which are Streptococcus pneumoniae and Haemophilus influenzae. When the meninges are inflamed, the blood-brain barrier may be disrupted. This disruption may increase the penetration of various substances (including antibiotics) into the brain. Antibiotics used to treat meningitis may aggravate the inflammatory response of the central nervous system by releasing neurotoxins from the cell walls of bacteria like lipopolysaccharide (LPS) (Beam and Allen 1977). Treatment with third generation or fourth generation cephalosporin is usually preferred. Epilepsy is a common neurological disease characterized by frequent and often untreatable seizures. Several clinical and experimental data have implicated failure of blood-brain barrier function in triggering chronic or acute seizures (Oby and Janigro 2006; Marchi et al. 2007; Seiffert et al. 2004; Urva et al. 2007; van Vliet et al. 2007). These findings have shown that acute seizures are a predictable consequence of disruption of the BBB by either artificial or inflammatory mechanisms. In addition, expression of drug resistance molecules and transporters at the BBB are a significant mechanism of resistance to commonly used anti-epileptic drugs (Awasthi et al. 2005; Loscher and Potschka 2005). Multiple sclerosis (MS) is considered an auto-immune disorder in which the immune system attacks the myelin protecting the nerves in the central nervous system. Normally, a person's nervous system would be inaccessible for the white blood cells due to the blood-brain barrier. However, it has been shown using Magnetic Resonance Imaging that, when a person is undergoing an MS "attack," the blood-brain barrier has broken down in a section of the brain or spinal cord, allowing white blood cells called T lymphocytes to cross over and destroy the myelin. It has been suggested that, rather than being a disease of the immune system, MS is a disease of the blood-brain barrier. However, current scientific evidence is inconclusive. Neuromyelitis optica, also known as Devic's disease, is similar to and often confused with multiple sclerosis. Among other differences from MS, the target of the autoimmune response has been identified. Patients with neuromyelitis optica have high levels of antibodies against a protein called aquaporin 4 (a component of the astrocytic foot processes in the blood-brain barrier) (Lennon et al. 2005). Progressive multifocal leukoencephalopathy (PML) is a demyelinating disease of the central nervous system caused by reactivation of a latent papovavirus (the JC polyomavirus) infection, that can cross the BBB. It affects immune-compromised patients and is usually seen with patients having AIDS. De Vivo disease (also known as GLUT1 deficiency syndrome) is a rare condition caused by inadequate transport of glucose across the barrier, resulting in mental retardation and other neurological problems. Genetic defects in glucose transporter type 1 (GLUT1) appears to be the main cause of De Vivo disease (Pascual et al. 2004; Klepper and Voit 2002). New evidence indicates that disruption of the blood brain barrier in AD patients allows blood plasma containing amyloid beta (Aβ) to enter the brain where the Aβ adheres preferentially to the surface of astrocytes. These findings have led to the hypotheses that: (1) breakdown of the blood-brain barrier allows access of neuron-binding autoantibodies and soluble exogenous Aβ42 to brain neurons; and (2) binding of these autoantibodies to neurons triggers and/or facilitates the internalization and accumulation of cell surface-bound Aβ42 in vulnerable neurons through their natural tendency to clear surface-bound autoantibodies via endocytosis. Eventually the astrocyte is overwhelmed, dies, ruptures, and disintegrates, leaving behind the insoluble Aβ42 plaque. Thus, in some patients, Alzheimer’s disease may be caused (or more likely, aggravated) by a breakdown in the blood brain barrier (Nagele 2006). The herpes virus produces the amyloid beta (Aβ) and has been found to be the pathogen responsible for being a major cause of the disease (UM 2008). It is believed that latent HIV can cross the blood-brain barrier inside circulating monocytes in the bloodstream ("Trojan horse theory") within the first 14 days of infection. Once inside, these monocytes become activated and are transformed into macrophages. Activated macrophages release virions into the brain tissue proximate to brain microvessels. These viral particles likely attract the attention of sentinel brain microglia and perivascular macrophages initiating an inflammatory cascade that may cause a series of intracellular signaling in brain microvascular endothelial cells and damage the functional and structural integrity of the BBB. This inflammation is HIV encephalitis (HIVE). Instances of HIVE probably occur throughout the course of AIDS and are a precursor for HIV-associated dementia (HAD). The premier model for studying HIV and HIVE is the simian model. Awasthi, S. et al. 2005. RLIP76, a non-ABC transporter, and drug resistance in epilepsy. BMC. Neurosci. 6: 61. Beam, T. R., and J. C. Allen. 1977. Blood, brain, and cerebrospinal fluid concentrations of several antibiotics in rabbits with intact and inflamed meninges. Antimicrobial agents and chemotherapy 12(6): 710–716. PMID 931369. Retrieved February 23, 2009. Brigger, I., J. Morizet, G. Aubert, et al. 2002. Poly(ethylene glycol)-coated hexadecylcyanoacrylate nanospheres display a combined effect for brain tumor targeting. J. Pharmacol. Exp. Ther. 303(3): 928–936. PMID 12438511. Retrieved February 23, 2009. Hamilton, R. D., A. J. Foss, and L. Leach. 2007. Establishment of a human in vitro model of the outer blood-retinal barrier. Journal of Anatomy 211: 707. PMID 17922819. Retrieved February 23, 2009. Hashizume, H., P. Baluk, S. Morikawa, J. W. McLean, G. Thurston, S. Roberge, R. K. Jain, and D. M. McDonald. 2000. Openings between defective endothelial cells explain tumor vessel leakiness. American Journal of Pathology 156(4): 1363–1380. PMID 10751361. Retrieved February 23, 2009. Klepper, J., and T. Voit. 2002. Facilitated glucose transporter protein type 1 (GLUT1) deficiency syndrome: impaired glucose transport into brain: A review. European Journal of Pediatrics 161(6): 295–304. PMID 12029447. Retrieved February 23, 2009. Lennon, V. A., T. J. Kryzer, S. J. Pittock, A. S. Verkman, and S. R. Hinson. 2005. IgG marker of optic-spinal multiple sclerosis binds to the aquaporin-4 water channel. J. Exp. Med. 202(4): 473–477. PMID 16087714. Retrieved February 23, 2009. Loscher, W., and H. Potschka. 2005. Drug resistance in brain diseases and the role of drug efflux transporters. Nat. Rev. Neurosci. 6: 591-602. Marchi, N. et al. 2007. Seizure-promoting effect of blood-brain barrier disruption. Epilepsia 48(4): 732-742. Nagele, R. G. 2006. Alzheimer's disease: New mechanisms for an old problem. University of Medicine and Dentistry of New Jersey Research 7(2). Retrieved February 23, 2009. Oby, E., and D. Janigro. 2006. The Blood-brain barrier and epilepsy. Epilepsia 47(11): 1761-1774. Pascual, J. M., D. Wang, B. Lecumberri, H. Yang, X. Mao, R. Yang, and D. C. De Vivo. 2004. GLUT1 deficiency and other glucose transporter diseases. European Journal of Endocrinology 150(5): 627–633. PMID 15132717. Retrieved February 23, 2009. Pritchard, T. C., and K. D. Alloway. 1999. Medical Neuroscience. Hayes Barton Press. ISBN 1889325295. Schneider, S. W., T. Ludwig, L. Tatenhorst, S. Braune, H. Oberleithner, V. Senner, and W. Paulus. 2004. Glioblastoma cells release factors that disrupt blood-brain barrier features. Acta Neuropathologica 107(3): 272–276. PMID 14730455. Retrieved February 23, 2009. Schreibelt, G., R. J. Musters, A. Reijerkerk, et al. 2006. Lipoic acid affects cellular migration into the central nervous system and stabilizes blood-brain barrier integrity. J. Immunol. 177(4): 2630–2637. PMID 16888025. Retrieved February 23, 2009. Segal, M. 2001. Blood-brain barrier. In C. Blakemore, and S. Jennett. The Oxford Companion to the Body. New York: Oxford University Press. ISBN 019852403X. Seiffert, E. et al. 2004. Lasting blood-brain barrier disruption induces epileptic focus in the rat somatosensory cortex. J. Neurosci. 24: 7829-7836. Silva, G. A. 2008. Nanotechnology approaches to crossing the blood-brain barrier and drug delivery to the CNS. BMC Neuroscience 9(Suppl. 3): S4. PMID 19091001. Retrieved February 23, 2009. University of Manchester (UM). 2008. Cold sore virus linked to Alzheimer's. University of Manchester. Retrieved February 23, 2009. Uva, L., L. Librizzi, N. Marchi, et al. 2007. Acute induction of epileptiform discharges by pilocarpine in the in vitro isolated guinea-pig brain requires enhancement of blood-brain barrier permeability. Neuroscience 151(1): 303-312. Retrieved February 23, 2009.
van Vliet, E. A. et al. 2007. Blood-brain barrier leakage may lead to progression of temporal lobe epilepsy. Brain 130: 521-534. Vein, A. A. 2006. Lina Stern: Science and fate. 11th Annual Meeting of the International Society for the History of the Neurosciences (ISHN). Retrieved February 23, 2009. This page was last modified on 24 February 2009, at 01:49.